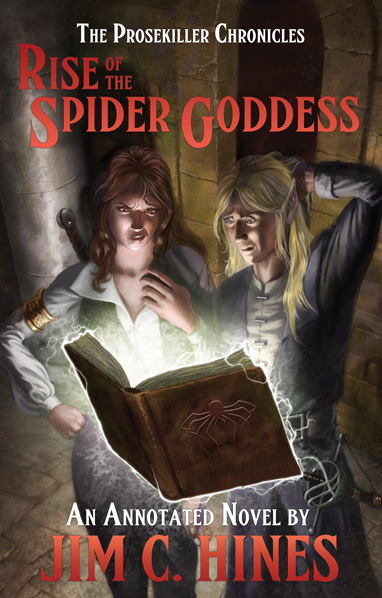 « Harassment at Context	» It’s Spider Goddess Day! I have 7 hours of train ride scheduled tomorrow, so I think I will get through one page or another ;-). Concerning the process: How did you handle the proof-reading process? I rarely spot my own mistakes and therefore need an external review against creative grammar and exotic spelling… Automatic spell checkers save a lot of work, but they have their limits. Was this crowd-sourced with friends & family? You can set up pre-orders for B&N by going through Draft2Digital (which, btw, is much easier to use than Smashwords and doesn’t do weird things to your files). Good to know, and thank you! I have been anxiously checking on B&N for my digital copy. First thing tomorrow, I am hopping on and getting it! Awesome! I’ll be buying that from Smashwords tomorrow. Thank you for including a DRM-free option. Ditto for this one. Even though some people hate Meatgrinding, I do like Smashwords store. Just grabbed it from Google Play. Going to the front of my To Read-pile. So – thank you! Really looking forward! I uploaded it directly as an .epub into Smashwords. It’s on my Christmas list! I like the cover, it reminds me of the Vesper Holly books. 🙂 Ordered my paperback today from Amazon.